Rajeev Ahuja, the Eternal Soul! It is very difficult to explain what phenomenon Rajeev Ahuja was. He was a whiff of sweet breeze that touched people around him very fondly and spread his eternal fragrance everywhere. He left his body last week, but it does not look like it. His fragrance is as fresh and his presence as vivid. As he is not amongst us anymore physically, it saddens us very much, but we are happy that he left this place of suffering and has merged with Para Brahma! He was associated with us in this life for a very short period (one month), but it seems that this connection transcended a few lifetimes. He used to say, “BTW is my true family. I have been waiting for it. Why should I hesitate to speak to anyone? My blood relations have only given me pain. They have never been a family to me. You people are my true relatives and I know you will accept me with open arms”. And yes, we all did! We accepted him with open arms… but never knew that his physical presence amongst us would be so short! From the first time Rajeev ji met Mohanji at the Delhi meditation on the 21th October, the deep connection was unmistakable. The immense transformation in him speaks for itself. Rajeev ji was introduced to Yamini at Ramana Kendra. He said that he had lost hope and doubted that he could feel unconditional love. Yamini cheered him up by affirming that to doubt is good. She said to him, “Please doubt well, so that faith can be equally transformative”. And what an experience he got! Almost throughout the meditation he cried profusely. When he opened his eyes after meditation he was a different person. He saw Mohanji sitting next to him, he saw sheer brightness of God and Universe, he felt that Mohanji gave him all the answers and made him pay all his dues, he felt empty and healed. Rajeev ji felt the freedom of the consciousness in each breath. He had done a lot of spiritual practices all his life and was a great writer and painter but words like ‘liberation’ ‘surrender’ were only concepts to him. He was fed up and just wanted to go beyond words. He broke his own conditioning and bindings and decided to have faith and just be open. And that’s it! It happened! Isn’t it true that when we come with an empty glass, Mohan ji fills that? When we come with an empty tub, Mohanji fills that? And when we come with an empty ocean, Mohan ji fills that, too? But how often do we consciously break our conditioning to be open to receive? How often do we become flexible in our minds? How often do we look within ourselves for our own patterns and ego blocks before asking for more? When ego is at play, Masters just witness and allow the experiences to happen. Unless, life puts us in situations where helplessness leads to surrender. And then the obstinate mind of man stills itself and starts to surrender willingly and lovingly to the enormity of divine love. In his own words Rajeev ji puts his connection with Mohan ji very clearly, “Time prepared me to be able to meet Mohanji after giving me enough hammering to be able to understand the concept of “unconditional love” through an insertion in the net, where Purity of thought and conditional love were the main criteria. When I met Mohanji for the first time he showed me all what I had never seen before. I wept and I wept and I wept with love. I wept like a baby. The difference had already been made! Mohanji had worked on me! This was the first time ever that I had actually seen something while my eyes were closed. Mohanji’s consciousness is so powerful that it works on you. You just have to watch. There was an unusual degree of love and concern. Rajeev ji was very expressive about his love for each and every person in BTW. He really loved Mohan ji. He compared himself with “Meera always in love with his Mohan”. He used to get restless if he was unable to speak to anyone of us. He even used to complain like a child if you missed his calls and did not reply to email. That was his longing and yearning to talk to his family, to be with them all the time. This was what he missed all his life. The feeling of being loved, the feeling of belongingness, the feeling that there were people who cared for him. That what he missed in his life, he saw in the BTW family. We were just the reflection of love that we get from Mohan ji and he use to see Him in all of us. This clearly reflected his ability to see things with heart and express it through his soul. He was a great visualize and artist too. On Ammucare day, he made a lovely poster. In a short period he was with us, he touched everyone very dearly. Mohan ji’s consciousness gave him everything. He hardly ever spoke/wrote to Mohan ji physically but in such a short span, he felt the Essence of the consciousness which is missed by people who come with fixed notions and expectations from a Guru, or limit the Guru principle to a physical frame. Direct communication is not necessary for deep connectivity. Bonding happens from the soul. How can we understand the divine with the limited human mind or our fixed ideas?? The results were visible to all. He was there with us for all seva activities. He connected with every member he met of the Gurgaon and Delhi BTW Family which touched us all deeply. The sufferings in his life were to polish the rough edges of his ego, and the love and divinity of that was visible to all. During his last few days he was suffering from acute gastroenteritis. Those few days he met all his family members, had healthy conversations with them. A night before he passed away a BTW member cooked some easy to digest- simple dal (pulses) and rice for him and sent it to his house. Rajeev ji came halfway to collect. On asking, he even told his wife that it was prasad from Mohanji. He ate that happily the next day too and went to bed. The morning after that he passed away in his sleep due to a heart attack, merging into the divine. His wish to be with Mohan ji was completed. His wife said that his face was so serene and peaceful and divine. The family is eternally grateful to Mohanji and also a bit surprised. Someone like Rajeevji who went through so much in life and didn’t have much peace passed away so beautifully with a glow on his face. Rajeev ji, your story and surrender inspires us all. We truly feel your angelic love and protection. When you said that you feel you’ve finally met your ‘spiritual family’ you meant it. No words can explain how mystically this shift has happened during last days of his life. The deep transformation. This whole process of merging of his consciousness, his bond with the infinite consciousness; Master’s consciousness. Lords and Master’s grace be Yours in abundance ! This was the first retreat with Mohanji ever. We spent two and a half days in His presence. It was 16-18th November. Full-day programme of various activities meant for cleansing and spiritual growth. The day began at 4am. We gathered at 4.30am for a water therapy. We avoided new accumulation of toxins by eating fresh and simple vegetarian food and drinking water, green tea or fruit juices, and we kept being active, without laying in bed for sleep or rest. Then before dawn we had yoga session. It was in the venue 1.5km away from our rooms, downhill, so we walked there before dawn. There are selected yoga asanas compiled in such a way that they work a lot on the energy of the spine and stimulate spiritual growth. 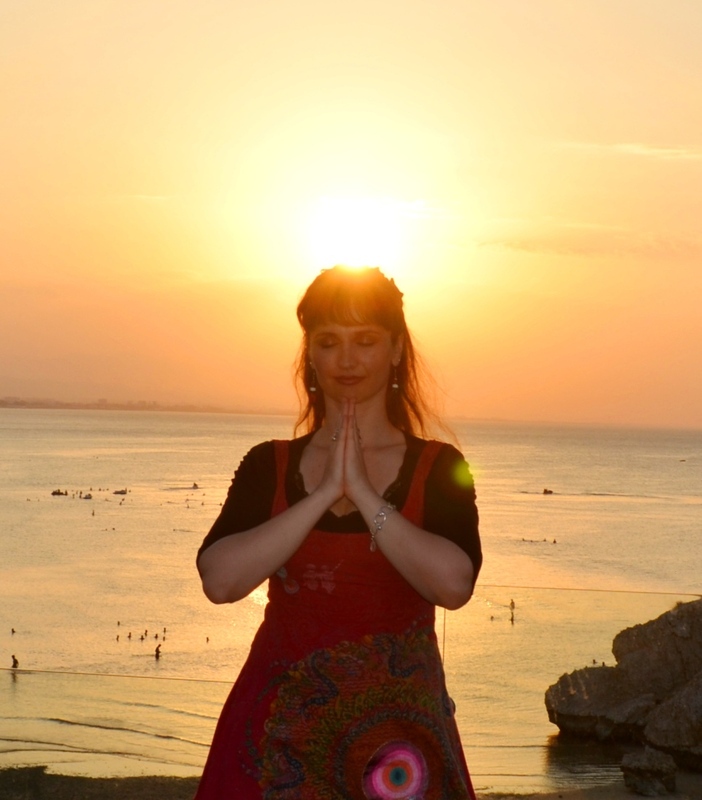 It was followed by energy balancing and replenishing, and AUM chanting. We were moving energies with our breath. Directing energies consciously is so powerful. Amazing. Yet, it is so simple. Afterwards, we went back along the same way, the mild uphill lane. The dawn had already broken and there was a fresh morning sunshine in the sky, both days. Oxygenized and refreshed, we went for breakfast. This was a special morning time, as we interchangeably sat with Mohanji, and we always mixed and changed places so that everyone can sit with everyone. No clusters were allowed, but some fluidity and one spirit. 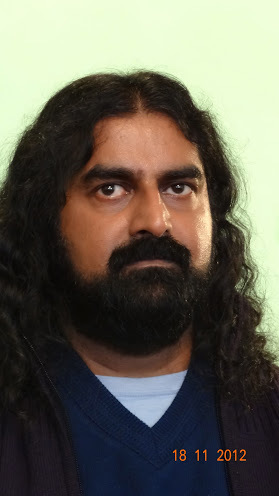 During one of this talks, Mohanji said how a woman who can see regardless of the distance, and can see Mohanji clearly wherever he is, called him saying she saw a big grey cloud from a group of people coming into him, and that she was horrified at the sight, warning him he would die if he takes so much poison from people onto himself. Mohanji replied to her “That’s why I am here”. He took all the negativities that started melting from our inner system and all the activities that stimulated cleansing. So much more could be scraped. Not a second was a fluffy holiday weekend. The experience was much more deeper as we were within the energy field of a master. People are usually not conscious of it. There is a feeling of relaxation. Apart from that, there was a feeling of headache. Everybody noticed that. And everybody noticed how Mohanji’s health deteriorated. He took huge quantities of the blockages, negativities or “poison” from people onto himself, and left to people only a mild headache. His one body was bearing that heroically. Through headache as a tangible symptom, we understood that cleansing was happening, that it was intense and real. We were bathing in his energy field. It was a true energy spa. He improved us all. I’m deeply grateful for this blessing. No words can describe it. My love increased. My awareness increased, too. Mohanji said that people will be aware of the changes more after two or three months. It will manifest in our everyday life. Now they do not know what happened in Vrdnik. Zoran from Macedonia knows. He already goes into blank states. During the satsangs, QA sessions, Milan, a journalist from “Sensa” magazine was keen on asking questions. He loves the chance he got to write a text about Mohanji. All Vrdnik experience boosted his inner growth, too. There was an interesting moment. When Milan interviewed Mohanji face-to face, he recorded the interview. But When he reached his room, the recorded just buzzed and nothing could be recovered. Mohanji’s energy was so strong, that the gadget failed! And he got deep answers that satisfied him, grateful for what he learned. Then he wrote a draft of their interview while it was still fresh. It was what was perceived on the surface. We bathed in Mohanji’s energy field. Each cell tuned to this vibratory level. We could not resist but be taken over by the higher into purer realms. Huge inner letting go, relaxation and stability happened. Spines got stronger. Questions were directed to the divine in human body that was in front of our eyes. Omnipresent infinite oneness of consciousness, truth, knowledge, abundance and compassionate love. Each Mohanji’s word was an elixir to the soul. He was removing layer by layer of our conditionings. This picture was taken by Dheeman Ranjan during the several seconds when Mohanji blessed Shashank as an old man during food seva in Gurgaon. When the day arrived today, it promised to be special. The bright Sunday morning looked like any other day, but there was something in the air which stirred up feeling of immense love. The feeling was blissful. It was a sign of something very special that was going to happen! Sunday mornings are associated with Food Seva that happens in Gurgaon where more than 300 labourers and their families are served hot breakfast. These labourers are daily wagers and don’t have permanent jobs. Many a times they don’t get work and sleep hungry. Sunday is one day they look forward to, as they get hot and nutritious breakfast with Mohanji’s blessings. Food seva usually lasts for 45 minutes. As seva has been happening for almost 8 months now, they look forward to it, eagerly standing in the line, waiting patiently. But today, it was different. There were just 5 people standing in the queue! Even when the serving started, more did not join. I waited, but there was no one coming. I waited more, then slowly very few trickled. It was very unusual. It was 30 minutes past and only handful of people had come to take food. Mind did try to work and think of possible reasons, “maybe it is too early today”, “may be they have shifted from there”…but the faith remained intact. Mohanji’s words echoed, “Numbers don’t matter; I will only send those who really need it, even if it is just one”. These words came as a relief. It reminded me that we were just instruments and only Masters decide who would par-take food! After waiting for some more time, I decided to pack-up with food for almost 200 people still left! I decided to distribute food to other locations. But the moment I was about to leave, an old man, who had his share of breakfast, walked up to me and said that the food tasted like amrit (elixir) as it was a very special day. I felt it was a nice gesture as it seemed that he was trying to comfort me as the food seva could not complete. I thanked him and touched his feet. He blessed me and said it was really a special and auspicious day! I wondered why it was special. On enquiring, he told me that it was a day before Chatt Pooja! Chatt Pooja is one of the most important festivals for people from the Indian states of Bihar and Uttar Pradesh. And almost all of the labourers in Gurgaon and neighbouring towns belong to these two states. I could then think of reason why they were not here as they would have gone home for celebrating the festival. I thanked the old man for comforting me. When I was about to go, he asked me to stay. There seemed no reason to stay as there was no one to feed. But there was something in his voice, something magnetic, which made me stop. He said that he has a feeling that the seva will be completed today. I smiled at his kindness and thought of staying only to make him happy. Then what happened cannot be put in words. Suddenly there was a stream of labourers and their families, with bag and baggage, walking towards the nearest metro station. They were going to the main railway station to catch the train home. I could not believe my eyes. One of the people from the group walked towards me and asked if he could have some food. I served him. Then suddenly the whole group stood in the line for food! And there was something different in their behaviour, they were smiling, laughing, enjoying. Usually they are somber and sad, but today they were elated! It seemed like a community celebration! And the best part was that every time they took the serving, the blessed! Never ever, they have blessed before. But today, everyone was blessing, including children. One of them started singing a song in praise of Bholenaath (the compassionate form of Lord Shiva). He loudly announced that the food was Shiva’s prasaad and their journey home would be blessed. It was such a blissful sight! When the last parantha (Indian bread) was served, all had the share of food! No one was left hungry. It had to be. They were chosen by the Masters! Even after the food was finished, the group stood there for a while, chatting laughing and singing. It was such an amazing sight. They had forgotten about their tough life and were enjoying the moments of NOW. I was speechless. I just had the feeling of reverence and immense gratitude. And I looked for the old man to thank him, and he was not there! I searched for him but he was gone. I don’t know who he was, where he had come from, as I had never seen him before. But I really wish that I meet him again in any of the coming Sundays, so that I can express my gratitude. 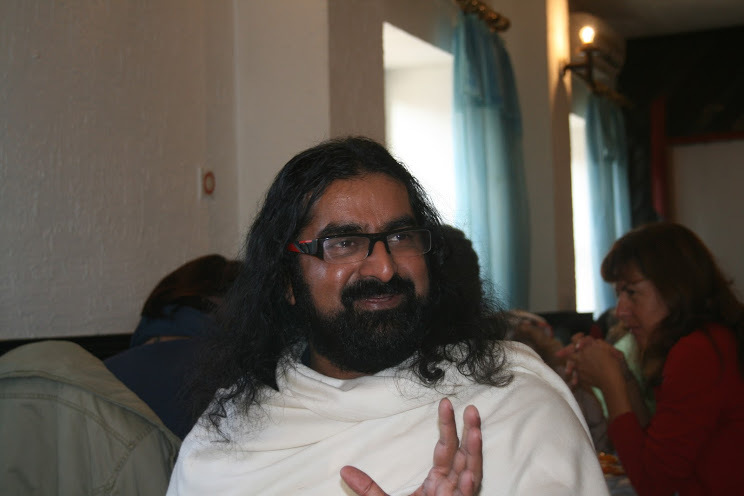 “While the food seva was taking place in Gurgaon, something interesting happened during the satsang with Mohanji in Vrdnik, Serbia . 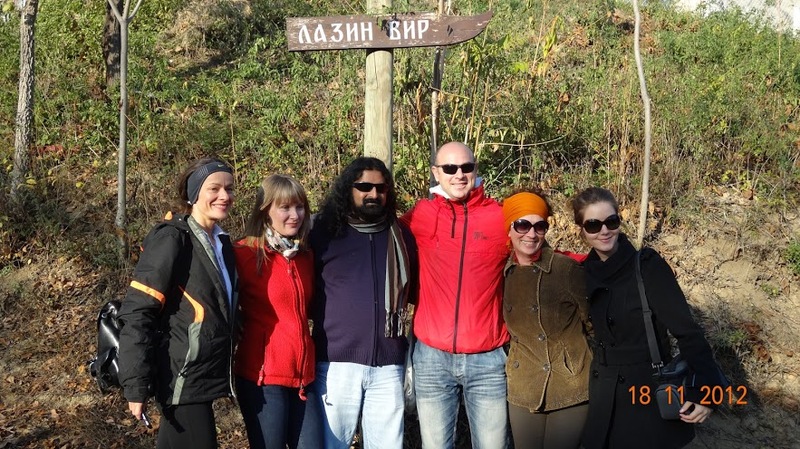 Oxygenized and relaxed after the water therapy and early morning yoga we all enjoyed the satsang. We bathed in the intense energy, being purified just by Mohanji’s physical presence. He talked and patiently answered both those new and those many times answered questions. His words hit our conditionings directly, unwinding layer by layer, bringing us to our soul. They were elixir to the soul. At one moment his face stood still, and his eyes became wider and bigger, as if he suddenly disappeared, and only the same expression on the face remained. He remained more than ten seconds in that state. It has been recorded by camera and will show on the video. 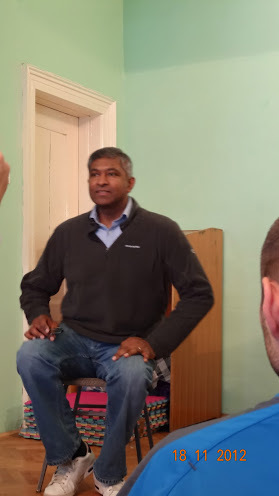 Rajesh (Vijay Ramanaidoo) explaining about Mohanji ACT Foundation that he founded in Great Britain, and which is psreading around the globe. He also introduced VIBRIONICS, a method of healing through vibrations. Vibrionics will heal the poor around the world through Act Foundation. The Serbian Vibrionics Team has been created, too. After the Saturday satsang we had lunch. For the meals of various parts of the day, we were constantly moving, changing places, mixing. Because of dynamics, we avoided making the same clusters. All sat with all. After lunch we went for a swim in the Hotel “Thermal” in thermal spa. The water is hot when it comes out of the ground, so it has to be cooled down to be warm for swimming. Because of the water content, it is healing rheuma. We swam, enjoying and playing like little children. In the evening, I thought, depending on the weather, we can go to the forest. “Don’t worry about the weather, I’ll take care about the weather” :), said Mohanji. A wonderful weather on Sunday was a gift, as November’s weather is unpredictable, and there could be strong winds and rains. But there was a sunshine and brisk, chilly freshness. Who could order weather? We were simply grateful. We went for the afternoon walk into the forest, to the place called Lazin Vir, or Laza’z vortex. A long time ago, a child called Laza (nickname of Lazar) drowned in that vortex. The place and the name remained, though there is much less water there now and it is not dangerous any more. There also used to be a waterfall there. Mohanji walked with us through the forest, too. What a blessing for the forest, too! 🙂 We felt one with nature, our hearts were chirpy, and bodies bubbly. We enjoyed it. 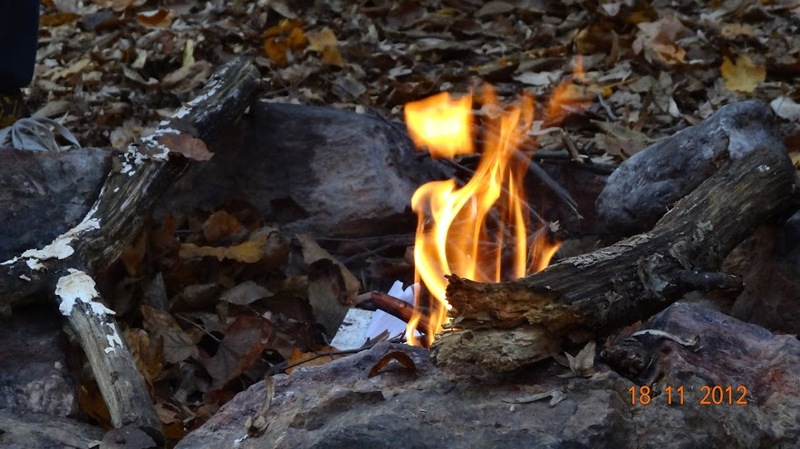 Fire has a significance as it is a purifier, and among elements, it has superiority because when water, air or earth cleanses, the remnants and dirt remain within. However, fire burns all, and disinfects all. Everything is burned to dust. There are also manthras for chanting around the fire and depending on the wanted effect, our ancestors lit fire of a particular size. During his visit to Serbia, Mohanji visited Slobodan Milićević – Ćići (Swami Chidananda)’s grave. Ćići was cremated and his urn rests there. Mohanji intended to meet him during his next visit to Serbia. Now he died. As the word is the second level of creation, Mohanji felt responsible to fulfill the promise and remove the debt. He also said that Chidananda expanded. Not only that he said so, but he also showed that to the lady who was his spiritual friend and was deeply connected to him. The Church of St. Petka (or Paraskeva) is a true place of power with an amazing energy, located within the historic Kalemegdan park (also known as Belgrade fortress), the largest park and most important historical monument in Belgrade. If you get a chance to go to Belgrade, aside from strolling through this beautiful park overlooking the confluence of Danube and Sava river, you should definitely experience the vibrations of this amazing Church as well and get the blessings of St. Petka. Her presence indeed can be felt there. In fact, the whole area around the Church and the little hill top nearby has an amazing vibration – whoever goes there feels refreshed and cleansed, although many probably don’t know why. Moreover, there is a miraculous spring of water which appeared in front of the church with Her blessings. This water has special healing properties – small bottles with this healing water are distributed in the church. That was the only time in my life when I sank so low that I did not care whether I would continue living or not. I totally lost my compass and what’s even worse, totally lost my self-respect. My mind made a big deal out of a mistake I made and a sort of a self-destructive mechanism got activated within me – there was no escape from my inner enemy and I didn’t know what to do with myself. Roaming around aimlessly all over Kalemegdan park on a cold winter day, I felt a pull to go to one specific area down the stairs covered with snow. I noticed a cute little building there and felt I should go inside. The moment I entered I realized it’s a Church. There was nobody inside and I took my time to carefully explore the frescos that cover the church walls and its ceiling/dome. It felt pleasant, with a beautiful vibe of loving intimacy. I was carrying a big load on my heart and simply I could not take it anymore. The moment I noticed a painting with a compassionate expression of a frail saint dressed in black clothes of a renunciate, I looked into her eyes and started praying intensely, sharing all my sorrow with her. 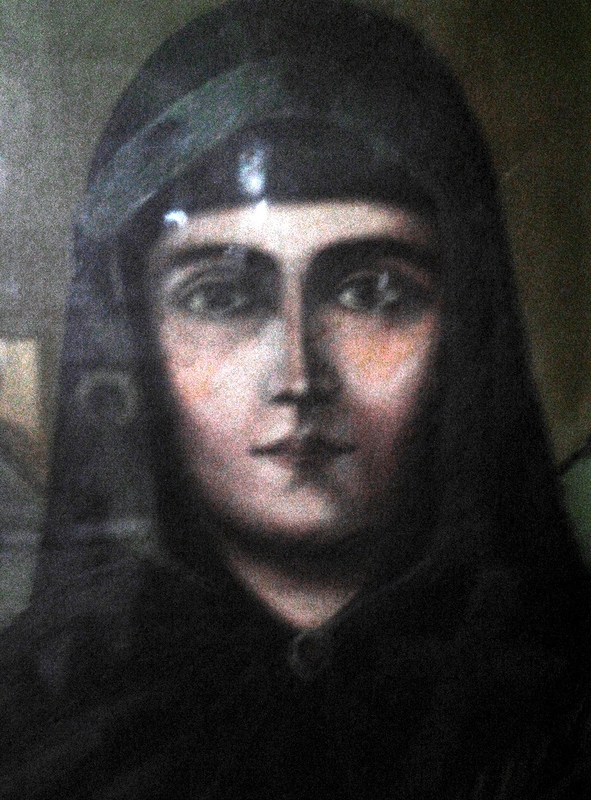 At that time I did not even know this was St. Petka (St. Paraskeva) a Christian saint and martyr (in brief, she lived in the 2nd century A.D. Born in a rich family, she divided up all her possessions among the poor and performed intense penance in the dessert. Due to her purity, she was given the blessing to perform miracles, which she used mainly for healing of the blind, deaf, etc. She was tortured by the Romans and her physical life ended in the year 140 when she was beheaded. During her life she performed many miracles, but even today she helps all those who pray to her with faith). I pleaded to her to help me start loving myself again and take me out of the quagmire I was in. My eyes were filling up with tears and thus my vision could have been slightly blurred, but at one moment I became breathless upon realizing – her eyes BECAME ALIVE. I will never forget those eyes and the intense compassion they radiated. They were a true fountain of bliss which, within seconds, melted all the negativities within me. At that moment all my inner brakes were gone and I sobbed loudly, bowing to her and asking her to bless me. And then all the crying stopped – I felt a big internal shift. I could not really pinpoint what that was because my analytical mind simply stopped functioning. I just enjoyed the incredible state I was in – super energized and flooded with immense love. I felt expanded and totally blissful. There was no more pain and definitely no thoughts – I just was, blissfully aware of everything around me, witnessing every breath of mine, simply being. My breathing was very slow and I was not even blinking. My awareness was spread all around me and there was a sense of oneness with the entire creation. At one point I moved towards the door – like a queen in a big flowing gown, I walked gracefully towards the stairs covered with snow. It was as if I was moving in slow motion. As I was witnessing myself climbing the stairs, my legs were doing the job of climbing but I could not feel my leg muscles being utilized. I was like a big cloud, much more than just the physical body – this feeling of lightness and bliss was overwhelming. 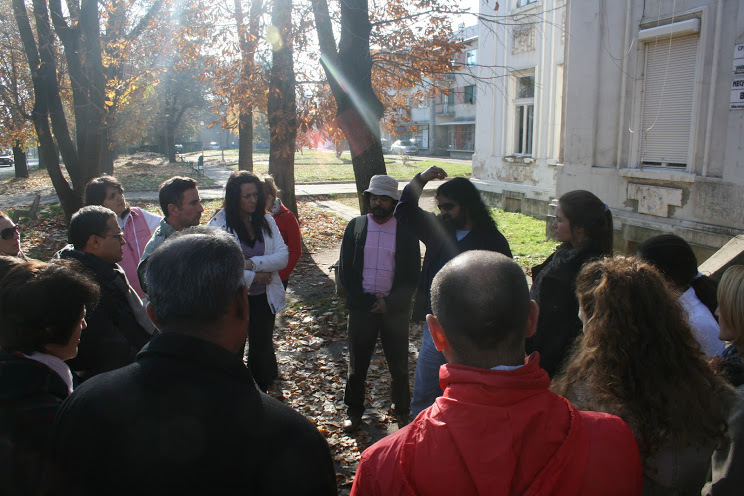 This continued during the entire walk through the park and it was only when I entered the busy ‘Knez Mihajlova Street’ buzzing with people that the ‘glass shield’ suddenly disappeared. The cold Kosava wind made its presence known right away. I touched my face and just stood there, filled with awe and excitement, ‘digesting’ the experience. There was no trace of my self-hatred or any negative feeling whatsoever. My mind was not able to explain what just happened. All I knew was that I was as down as I could be and St. Petka uplifted me in the way I never thought was possible. 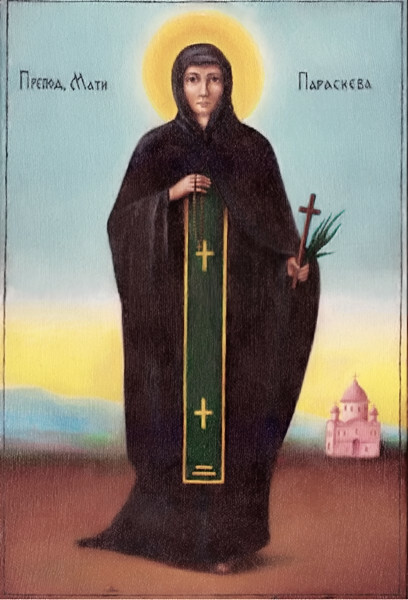 In the language of Christian Church, St. Petka is a saint and a martyr, while in spiritual terms she is a great Master who operates from higher realms of consciousness and continues to shower her blessings on those who connect with her with faith and an ‘open cup’. 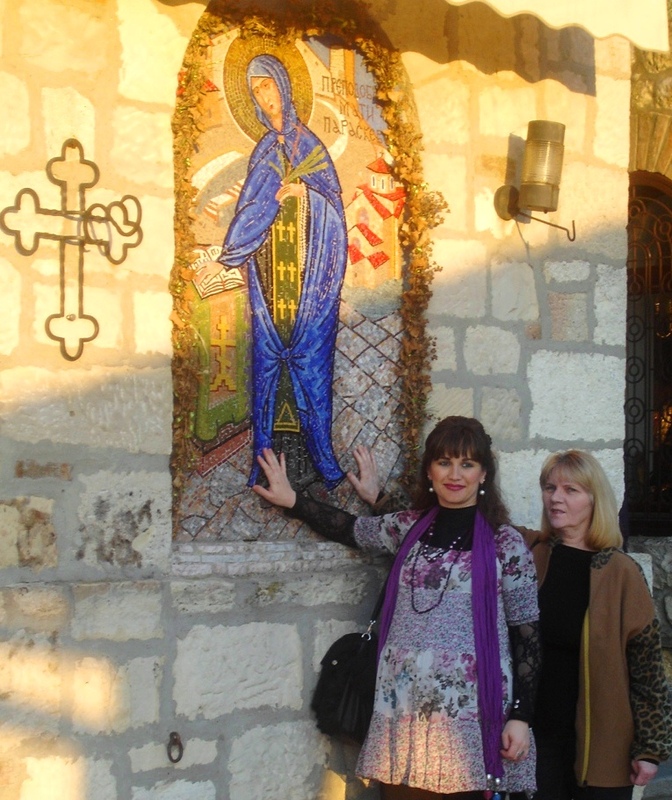 Two years later, again, I recognized this most beautiful state which reminded me of St. Petka’s blessing – as always, it happened when least expected. There was a small group of us in Muscat who gathered to perform Pada Pooja (worship of the feet of the Master) to Mohanji. I was not familiar with the chants and I did not know about the subtle connection between the third eye and big toe, but the moment after I bowed to Mohanji touching his big toe (through which immense energy was oozing out) with my third eye/forehead, I felt a very powerful energy which catapulted me into this most beautiful blissful state once again. I barely managed to sit down and there I was again, in this most wonderful expanded state, as if within a huge ‘glass shield’ of purest beingness and bliss.